The Magic Detective is up to his old tricks, actually NEW old tricks. Over these past several months you may have noticed my absence from the blog. This is mainly due to my performing schedule. It's great to be busy! But along the way I luckily and happily stumbled upon a great opportunity. I'm currently working to recreate part of the act of a magician from the past and I'll be presenting it in the Fall. The act I'm working on is a silk/flag/ribbon act. The key feature of the act is something known as The Flags of All Nations. This was apparently the creation of Johann Hofzinser. Yes, he created more than just card tricks. From what I've found his version was called 'The Patriot'. It's been a lot of fun digging up information on this old gem. I have also found it in the book, The Modern Conjurer by C. Lang Neil, simply called The Flag Trick, but this book also mentions it was known by other names such as 'The Congress of Nations' and 'The Multiplying Flags'. It was a popular routine in the Victorian era and early 20th Century. And it evolved over time into a very elaborate series of productions. In it's simplest form it began as several small flags that vanished or transformed into colored ribbons. From the ribbons larger flags would be produced and eventually a giant flag and flagpole! It seems that each performer added his own touches to the routine. Who performed this trick? Hofzinser, Eugene Laurant. Edward Maro, David Devant, Karl Germain, LeRoy, Talma and Bosco, J.B. Bobo, and even Harry Blackstone Sr. had a unique twist on the concept. It must have been an extremely popular effect because the trick is featured on a number of stock magic posters. The Flags of All Nations isn't really made anymore. There have been some small reproductions of parts of the routines in the past, but I've not found the whole thing anywhere. Thankfully, by combing through my large library of historical magic books, I've been able to figure out where to find 'some' of the items required. My most recent acquisition were two Silk Fans which are spring loaded. In the photo above I'm holding the silk fans. These aren't flags, but they will do for what I need. I may end up having larger versions of this item made for the routine. I venture to say that once I've finished all the research and found or built all the items, I'll be the only 21st Century magician performing this classic from yesteryear. I'll have more news on my 'recreation' of the act later in the Summer as well as info on whose act I'm recreating. 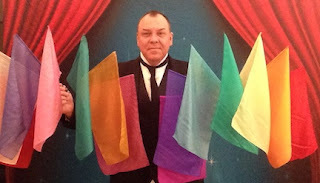 For now, enjoy this image below of a magician who featured The Flags of All Nations (his was called The Flags of The World) prominently in his show. In addition, check out the incredible Friedlander Stock Image here, and a small image of an incredible LeRoy, Talma and Bosco poster here.